Warning: due to moving house, blog posts in the coming weeks may be random/erratic/few and far between/all of the above. 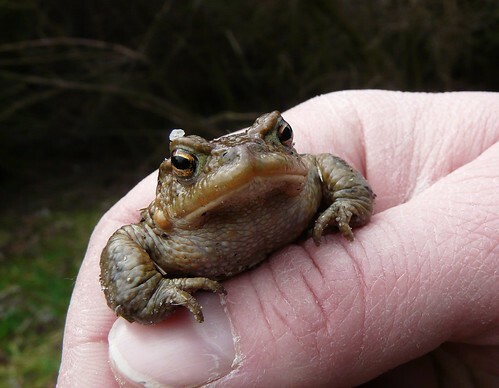 Today, for example, I’m posting a toad. We rescued him from the middle of a busy path at the weekend and seemed to quite enjoy having his photo taken. He’s rather handsome, don’t you think? Do you think if I blow him a little virtual kiss he will turn into an even more handsome bloke? Moving is Stressful. Super Stressful. Take your time, gorgeous! Best of luck with the move, Wendy. Gen – Can’t quite imagine Rufus being freaked out! Lucy – Handsomer than that toad? Surely not. 🙂 Don’t remember moving being quite this stressful before. I’ve been going for the “get it over as quickly as possible” method rather than what you’ve suggested. Starting to regret it. I’m tired. Yes, he’s adorable, a fine, rolly-polly figure of the toad. Compassion towards animals always lightens my heart a little. Moving is one of the top-5 life stresses. After moving far more times in my life than I would have liked to, I find you get less resilient after each occasion. Setting some priorities may help you handle the load, like getting kitchen, bath and bed organized first. Good luck! I tend to favour your method, too, Wendy…I always just want it all over ‘n done with quick as a flash. Atoadable he is! Good luck with the move! I hope you have taken a day off to protect yourself from the stress of the move. I know how tough it can be–so disorienting. Good luck; may the toad be with you. Best of luck with moving dearie. It’ll be over soon. Hope Marco settles into his new abode. Frogs and toads are creatures I prefer to admire from afar – so your photo is gorgeous. I wouldn’t be quite so happy if it was in the house . . .
Ha! Great stuff. Funny, we seem to be rescuing loads of love making frogs from the middle of our road at the moment. They are at it non-stop! Pia – Thank you! Hoping to find one of those tea strainers for the new house! Holler – Yeah… I don’t remember it being quite this stressful before! Christina – Lol! Thank you. I’m entitled to a day off but am so busy at work just now I haven’t taken it. Ridiculous, I know, but I think I’d get even more uptight being off work just now. The Easter hols start in a week and three days though!! David – Good grief. Amphibians have no sense of decorum at all! One of my favourite kid’s songs is about toads. It goes “you’ve got to love him, warts and all”. I guess with this in mind I could see your toad as handsome.